(Nanowerk News) It might not be long before consumers can just hit "print" to create an electronic circuit or wireless sensor in the comfort of their homes. Engineers at the University of California, Berkeley, in collaboration with colleagues at Taiwan's National Chiao Tung University, are expanding the already impressive portfolio of 3D printing technology to include electrical components, such as resistors, inductors, capacitors and integrated wireless electrical sensing systems. They have put the new technology to the test by printing a wireless "smart cap" for a milk carton that detected signs of spoilage using embedded sensors. The findings are to be published Monday, July 20, in a new open-access journal in the Nature Publishing Group called Microsystems & Nanoengineering ("3D-printed microelectronics for integrated circuitry and passive wireless sensors"). "Our paper describes the first demonstration of 3D printing for working basic electrical components, as well as a working wireless sensor," said senior author Liwei Lin, a professor of mechanical engineering and co-director of the Berkeley Sensor and Actuator Center. "One day, people may simply download 3D-printing files from the Internet with customized shapes and colors and print out useful devices at home." Polymers are attractive materials in the world of 3D printing because their flexibility allows them to be formed into a variety of shapes. However, such materials are poor conductors of electricity, and thus bad candidates for electronic devices. To get around this, the researchers started off by building a system using polymers and wax. They would then remove the wax, leaving hollow tubes into which liquid metal - in their experiments they used silver - was injected and then cured. To answer that, the researchers integrated the electronic components into a plastic milk carton cap to monitor signs of spoilage. 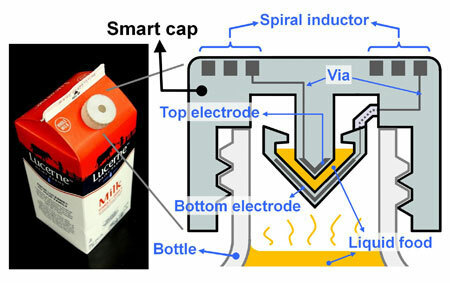 The "smart cap" was fitted with a capacitor and an inductor to form a resonant circuit. A quick flip of the carton allowed a bit of milk to get trapped in the cap's capacitor gap, and the entire carton was then left unopened at room temperature (about 71.6 degrees Fahrenheit) for 36 hours. "This 3D-printing technology could eventually make electronic circuits cheap enough to be added to packaging to provide food safety alerts for consumers," said Lin. "You could imagine a scenario where you can use your cellphone to check the freshness of food while it's still on the store shelves." "That would be very difficult because of the extremely small size of modern electronics," he said. "It might also not be practical in terms of price since current integrated circuits are made by batch fabrication to keep costs low. 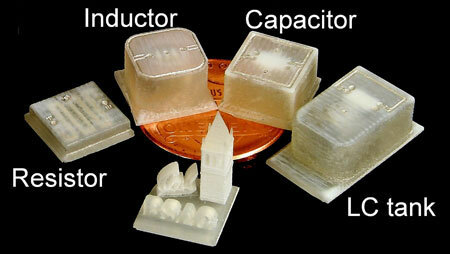 Instead, I see 3D-printed microelectronic devices as very promising for systems that would benefit from customization."